CCI Corporation, Japan has specially engineered this product of MAN Vechicles. Using other coolants, which are not genuine products, may lead to premature system failure and a drop in vehicle performance. This product has been approved by MAN Germany for use in MAN Vehicles. Customer Benefits : MAN Genuine Coolant is an advanced formula ethylene glycol based product which uses state of the art technology. 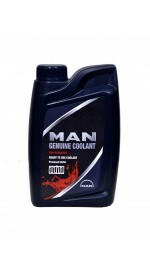 MAN Genuine Coolant provides long lasting protection for aluminium, cast iron and all other engine components. Remove the used radiator liquid from vehicle and clean the radiator interior . Pour the MAN L -415 Ready to use coolant liquid directly into radiator to the max level. Pour into expansion bottle till between the marks. Protect the environment. Dispose off used product to an authorised re-processor. Consult the list available with state/UT Pollution Control Board. Question : Why should i use a ready to use’ coolant of a concentrated version? Answer : 1. Normal water which is mixed with concentrated coolant has high hardness and corrosive elements, which leads to drop in coolant strength and service life, thus requiring frequent changes. Normally a 1 litre concentrated coolant is mixed with varied quantities of water resulting in wrong concentration of coolant in your car, leading to corrosion, deposits and water pump seal water. A ready to use’ coolant is factory prepared with special additives at the correct coolant concentration which adds strength and service life. A ready to use’ coolant will maintain a uniform concentration throughout and is also extremely convenient to use.